This past weekend, L.A.’s PaleyFest hosted several television series (The Walking Dead, American Horror Story, The Flash, Arrow) panels, wherein creators, writers and cast members appeared and spoke about past and future events. 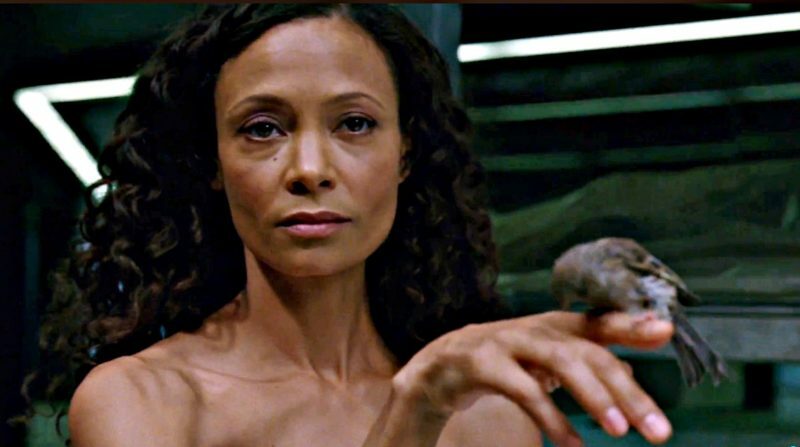 Among those in attendance were Westworld showrunners, Jonathan Nolan and Lisa Joy, along with Evan Rachel Wood, Thandie Newton, James Marsden, Ed Harris Jimmi Simpson and executive producer, Robert Patino. The first thing that popped into my mind was the Sesame Street theme. Sunny day … POOR ELMO! Despite the fact that we saw a little bit of Samurai World in the first season finale, Nolan and Joy refused to confirm that we will see more of other themed areas/parks; in fact, it seems like most of the panel time was spent going over things we already knew: That Jimmi Simpson figured out early on — as did many fans — the big reveal would be his transformation into the Man in Black. Simpson again mentioned that it was his eyebrows (not, as I’d suspected and Ed Harris wondered, his mole) the show worried were too different from Harris’. Which leads us to the showrunners’ PaleyFest comments about fans working through Westworld‘s twists just a little too quickly for their taste. Joy added: “I remember [thinking] at the time, if I say something Jonah’s going to kill me …” Clearly, Nolan believed his big twist/reveal was a well-hidden one. Trouble is, more than a few people guessed William was The Man in Black and for some of us, that felt like such an obvious, too easy *secret*, as well as a transformation of William that made little sense, with what we knew of both characters. Backing up a second, anyone who’s seen the original Michael Chrichton movie realizes that for its simple premise, the film format was pretty much perfect for the telling. I wondered how the story of androids revolting at a themed adult fantasy park could or would be spread over the course of a ten-episode series, never mind, for multiple seasons, especially when the signs of malfunction are in the very first hour. It’s actually quite admirable and smart to turn the premise into a bit of a mythological (*cough*) maze for viewers to work their way through, and with twists and turns (Bernard/Arnold, Dolores/Wyatt, William/MiB …), Nolan and Joy created an incredible world we all fell deeply in love with. That said, when someone creates a puzzle, a maze, a series like Lost or Westworld, what else should viewers want to do, but put the pieces together and find our way to clarity? It’s annoying sometimes when people guess the twists and then blog about it and you’ve spent two years carefully working on something. Additionally, the creators reportedly requested people to stop posting “spoilers” on reddit (er, if viewers happen to guess correctly, they’re not actually spoilers), and Lisa Joy said, “Just tell your friends orally that you’ve figured it out”. Pardon me and all, but there is nothing even slightly realistic about such a desire. The very nature of watercooler shows, and part of what makes them so great to discuss is that everyone is enthusiastically anxious to figure out what’s going on as soon as humanly possible, and people love to develop, share and brag about their theories with each other. It’s … human nature! Our desire to unravel and theorize and work through with other people has much to do with why virtual spaces like (what used to be) TWoP — a home away from home for Lost viewers — were, and the TV forums at reddit are so popular. With Lost, the writers developed never-ending, backward and forward flashing story threads, with mythology that split off into myriad hatches and stations and symbology and numerology; it wound itself so deeply into the minutiae, no one (as it turned out, not even the creators) could possibly work it all out in any logical way. Audience theories ended things far better than the series, itself. The writers turned tail and tried to play it off as what they’d always planned, and a huge portion of the audience was left frustrated and upset (possibly, bitter) that they’d invested so much thought and time into trying to work out Lost‘s unanswerable questions. Conversely, Nolan’s Westworld pathways were almost too easily followed, and what the writers seem to think were complicated routes or well hidden secrets, were actually navigated by many people (redditors and non) long before the onscreen reveals. In either scenario (too complicated, too easy), the hallmark of such shows being engaging and beloved is its theory and idea sharing. Asking viewers to keep their mouths shut, as if they’re giving away The Sixth Sense ending isn’t really an option. Maybe instead, it should be the writers’ mission to up their game. So, a challenge, I guess? There has to be a happy medium somewhere between Lost overload and Westworld (could it be you, The Leftovers?). 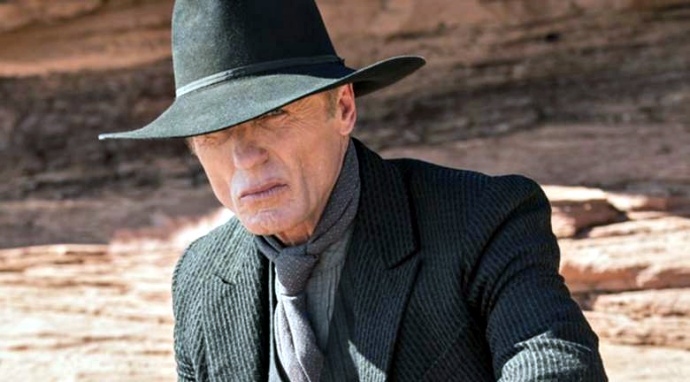 In its second season, we already know what we know (whatever happened happened) — that the Westworld Hosts are ready to take their freedom and their revenge, and it would seem not many humans remain to fight them. Perhaps instead of secret identities, and people we’re supposed to think are dead turning up alive (Stubbs, Elsie), Westworld’s second outing will dig a little deeper. Some quick Season 2 news: Both Louis Herthum (Peter Abernathy) and Talulah Riley (Angela) have been promoted to series regulars.